My Plaid Pursuit continues with another garment from Butterick 5147 - the Jacket. I did the dress twice, first with V. Wang's charcoal houndstooth plaid and the second one in a brown/cream plaid from Joann's, who can go wrong with a simple design such as this one. Were the instructions easy to follow? The instructions were very clear and really like the jacket pattern, because it provides lining pattern pieces. I did have issues with the lining not being long enough. I lengthened the lining hem line by adding a lace trim and sewed the jacket hem to the lace. What did you particularly like or dislike about the pattern? There is nothing to dislike about this pattern. The garments are right in sync with my sense of style. Pattern alterations or any design changes you made: I cut a size 18 according to my bust measurement. However, the jacket appeared too roomy and since I did not want to fiddle with the side seams, I tweaked the jacket for a closer fit by folding the front edges to the inside and added bias trim along the edges. Instead of buttons I went with large hooks & eyes, I like the exposed eye, my eccentric embellishment. When I make sleeved garments I have to cut the sleeves a size smaller, but maintain the cap size. However, I had to decrease the sleeves circumference more by removing 3/4 of an inch. The sleeve lining was not sewn to the jacket lining, instead I inserted the sleeve lining into the fabric sleeve and then attached to the jacket. I serged lining & jacket around the armhole before attaching the sleeves. Here is a close-up of the collar where I attempted to match up the print. Conclusion: I really like the peter pan collar which provides a cute styling detail to a suit, when one wants to detour from the power suit look. Fantastic jacket and entire ensemble. Great job. Your pieces are wonderful and look great on you too! The set is great. I really like your jacket. 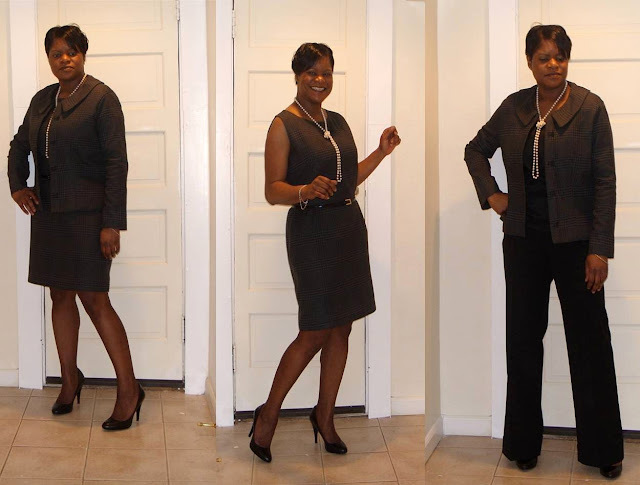 This outfit is corporate chic! I think this is one of the best corporate outfits in blogland this year. I may use this pattern for some red suiting that I bought recently. Love it and so nicely sewn! Yeaaaaaaaaah!! I hear the Jill Scott song going through my head right now "Hate on me hater, now or later". You are rockin' that outfit. It fits you sooooo nicely. You did a beautiful job!! I love your outfits & you look great! You work it!! This is really a go-to pattern for you! That pattern has been in my stash for a long time too. I'm seriously contemplating a sheath dress - maybe that's the one I should try. YOU LOOK WONDERFUL! This is a lovely colletion of garments. I love your idea of cutting the sleeve a size smaller. I'm going to do that next time. It's a great idea for when a jacket is going over a sleeveless sheath. I find that more and more I ignore the pattern sizes and use the finished measurements printed on the pattern. You've got great legs, too! Great job, looks good on you! !really like the hooks on the jacket. Love these pieces. You look fantastic! You look fabulous. Honestly, you can go anywhere in that dress and jacket. Work, church, church-type affairs, luncheons, dinners. Anywhere. You look absolutely wonderful in all the pieces! I have this pattern and now after seeing how great your ensemble looks can't wait to sew it up. Your jacket is great! I never noticed this pattern. You did such a nice job on it. I bet it's even better in person - I have this fabric, and it's so nice and soft. Bravo! You do such wonderful tailoring! And you look like a model! :) Very pretty and you look elegant in your tailored suite! THANK YOU so much for the fabulous compliments! ..and Thanks even more b/c having such awsome followers, reading your blogs daily and I mean daaaily... I am continuously inspired by your creations, techniques and showing me that I can have 90% of my closet full of personally made garments that I can wear proudly. Looks AWeSoME!! I love it and the hook and eye! I like the hooks alot! Very nice touch. ALL of those pieces are so beautiful! You look fabulous and "sew" professional! Great job. Beautiful and professional looking sewing! Looks great on you! What a beautiful job you did with this pattern! I like the collar, too. It's very feminine but not fussy. One of these days, when I learn to sew, I'm going to have to reference all of your helpful hints! Chic & professional & very inspiring. I will be bookmarking this posting for future reference.